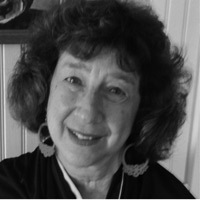 MARGOT WIZANSKY is a painter and poet, with poems in journals such as Poetry East, Lumina, Tar River Review, Quarterly West, and several anthologies, including Beyond Forgetting: Poetry and Prose about Alzheimer’s Disease and a poem in the Cancer Poetry Project’s second anthology. She also has edited two anthologies, Mercy of Tides: Poems for a Beach House (2003), and Rough Places Plain: Poems of the Mountains (2006). In 2008, she won the Writers @ Work Poetry Fellowship competition, and in 2010, the Patricia Dobler Poetry Prize, to travel and write in Ireland with the Carlow University MFA program. Margot transcribed the oral history Don’t Look Them in the Eye: Love, Life, and Jim Crow, the story of Emerson Stamps, grandson of slaves, told in his words and her poems. Her manuscript Here Comes Love! is in the final round of the National Poetry Series Open Competition.